WHEN the collecting bug bites a hobbiest, one never knows what the outcome will be. Some victims react the usual way and save coins, stamps, match covers, etc., but others aren't satisfied with interests so ordinary. They choose unique fields, to say the least. But they are equally as fanatic as their more conventional brothers and sisters and consider their collections just as valuable. 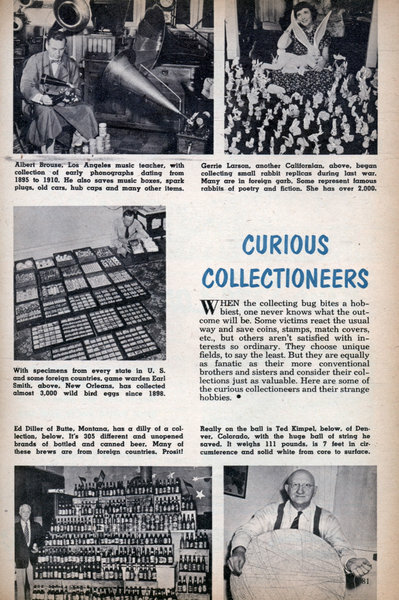 Here are some of the curious collectioneers and their strange hobbies. 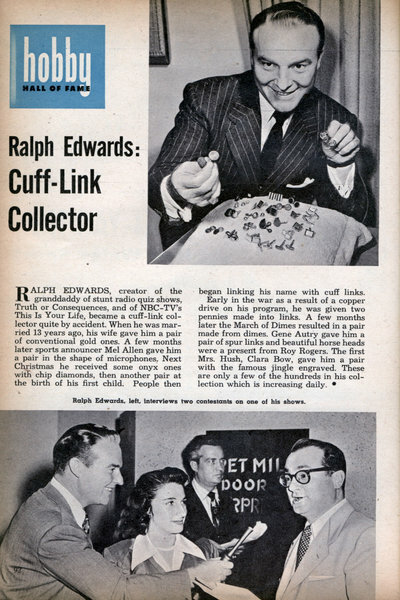 RALPH EDWARDS, creator of the granddaddy of stunt radio quiz shows, Truth or Consequences, and of NBC-TV's This Is Your Life, became a cuff-link collector quite by accident. By Eric Northrup EMIK AVAKIAN sits in his wheel chair surrounded by electronic miracles. He is a victim of cerebral palsy which has handicapped his body but not effected his brilliant mind. 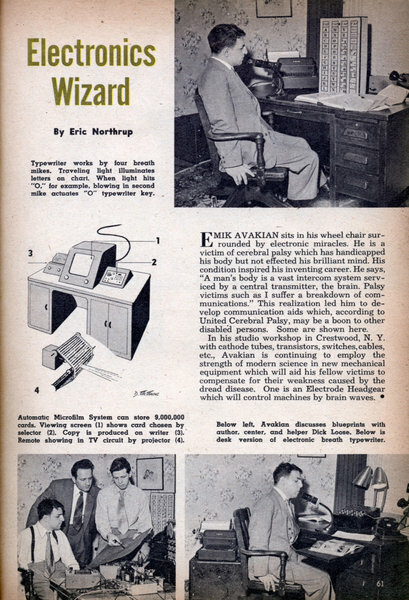 His condition inspired his inventing career. He says, "A man's body is a vast intercom system serviced by a central transmitter, the brain. 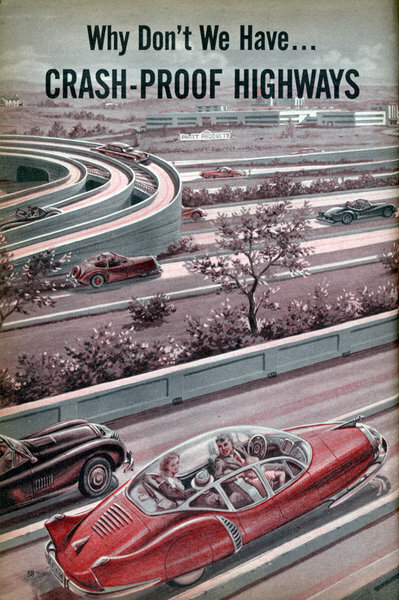 ... with automatic pilots to take the wheel for trip-weary, accident-prone drivers. 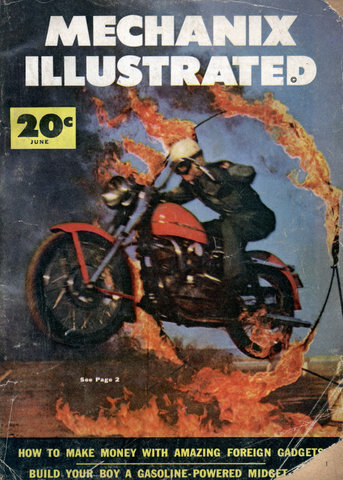 By George W. Gibson IN this age of flying saucers and 600-mph aircraft, automatic pilots are accepted as being very commonplace . . . for airplanes. But why not automatic pilots for autos? If an inventor should offer the motorist an automatic pilot for his car, consider the tremendous safety value of such a device. The human element would be eliminated from driving. 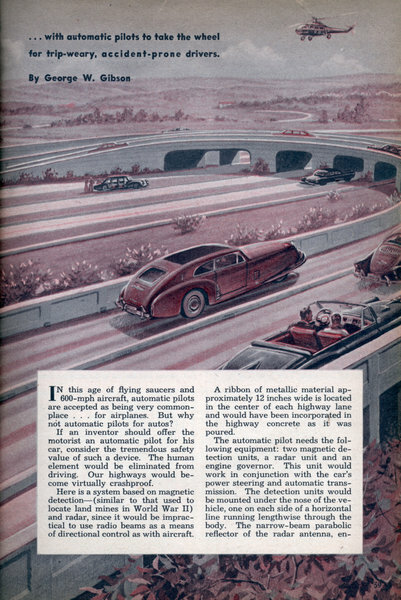 Our highways would become virtually crashproof. 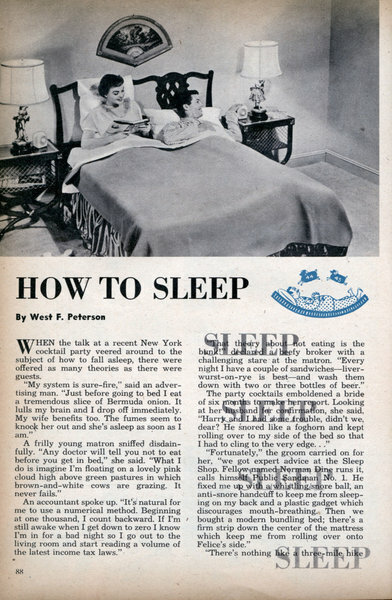 By West F. Peterson WHEN the talk at a recent New York cocktail party veered around to the subject of how to fall asleep, there were offered as many theories as there were guests. "My system is sure-fire," said an advertising man. "Just before going to bed I eat a tremendous slice of Bermuda onion. It lulls my brain and I drop off immediately. My wife benefits too. The fumes seem to knock her out and she's asleep as soon as I am." A frilly young matron sniffed disdainfully. "Any doctor will tell you not to eat before you get in bed," she said. "What I do is imagine I'm floating on a lovely pink cloud high above green pastures in which brown-and-white cows are grazing. It never fails." 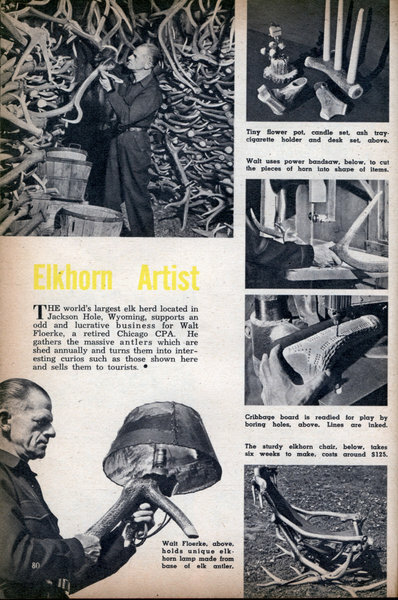 Elkhorn Artist THE world’s largest elk herd located in Jackson Hole, Wyoming, supports an odd and lucrative business for Walt Floerke, a retired Chicago CPA. He gathers the massive antlers which are shed annually and turns them into interesting curios such as those shown here and sells them to tourists. Amazing Bargain Offer! 25 Stamps, Ail Different Guaranteed to Be Worth Over TWICE as Much! More people buy stamps from Littleton than from any other concern in the world! 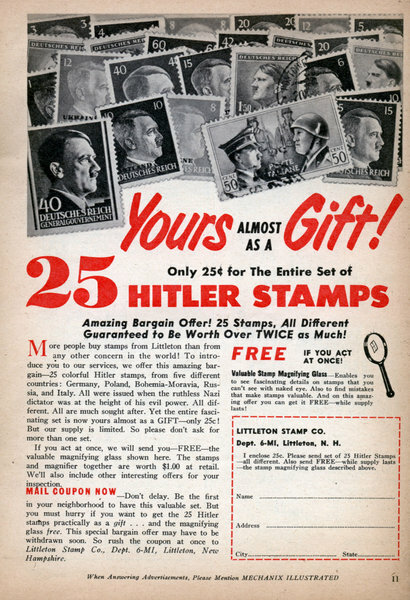 To introduce you to our services, we offer this amazing bargainâ€”25 colorful Hitler stamps, from five different countries: Germany, Poland, Bohemia-Moravia, Russia, and Italy. All were issued when the ruthless Nazi dictator was at the height of his evil power. All different. All are much sought after. Yet the entire fascinating set is now yours almost as a GIFTâ€”only 25c! But our supply is limited. So please don't ask for more than one set. American inventors are passing up a sure-fire gold mine! New devices, popular abroad, would find a ready market in gadget-conscious U. S. A. 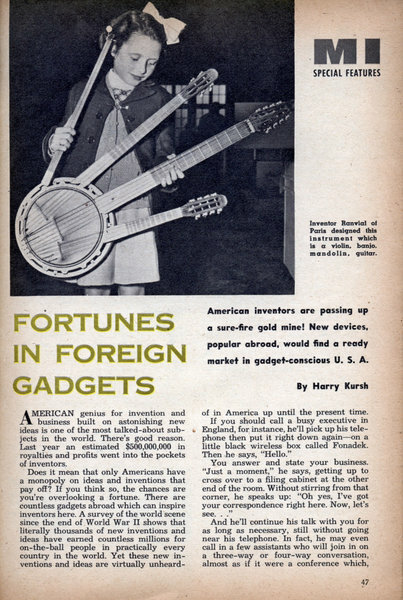 By Harry Kursh AMERICAN genius for invention and business built on astonishing new ideas is one of the most talked-about subjects in the world. There's good reason. 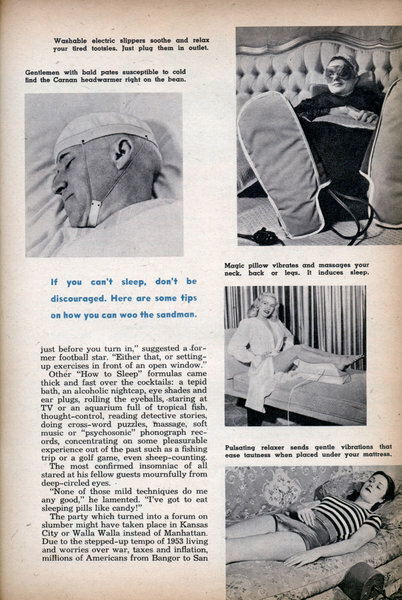 Last year an estimated $500,000,000 in royalties and profits went into the pockets of inventors. Does it mean that only Americans have a monopoly on ideas and inventions that pay off? If you think so, the chances are you're overlooking a fortune. There are countless gadgets abroad which can inspire inventors here. 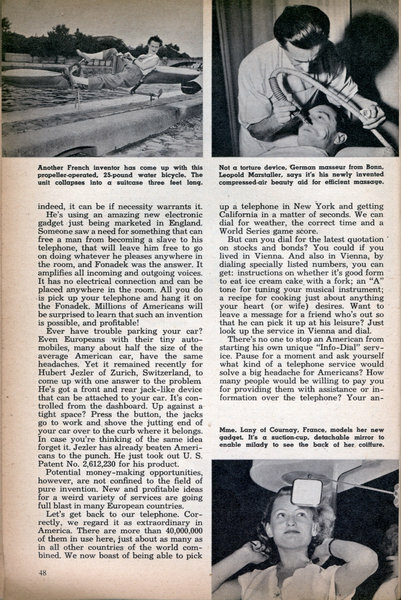 A survey of the world scene since the end of World War II shows that literally thousands of new inventions and ideas have earned countless millions for on-the-ball people in practically every country in the world. Yet these new inventions and ideas are virtually unheard-of in America up until the present time. 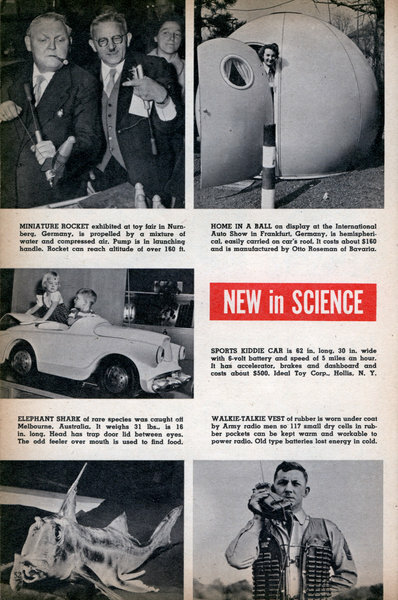 MINIATURE ROCKET exhibited at toy fair in Nurnberg, Germany, is propelled by a mixture of water and compressed air. Pump is in launching handle. Rocket can reach altitude of oyer 160 it. HOME IN A BALL on display at the International Auto Show in Frankfurt, Germany, is hemispherical, easily carried on car's roof. It costs about $160 and is manufactured by Otto Roseman of Bavaria. SPORTS KIDDIE CAR is 62 in. long, 30 in. 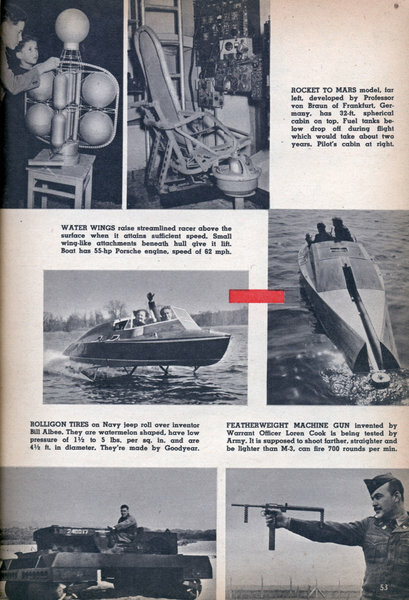 wide with 6-volt battery and speed of 5 miles an hour. It has accelerator, brakes and dashboard and costs about $500. Ideal Toy Corp., Hollis, N. Y.
I love this picture. 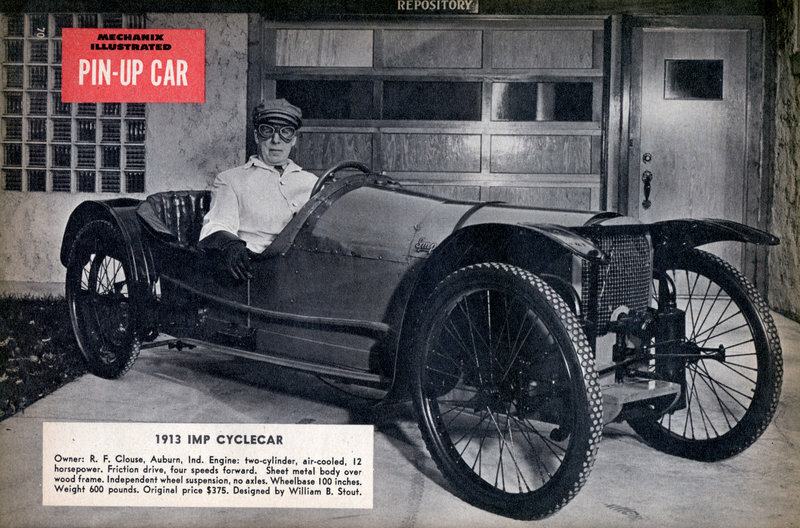 MECHANIX ILLUSTRATED PIN-UP CAR 1913 IMP CYCLECAR Owner: R. F. Clouse, Auburn, Ind. Engine: two-cylinder, air-cooled, 12 horsepower. 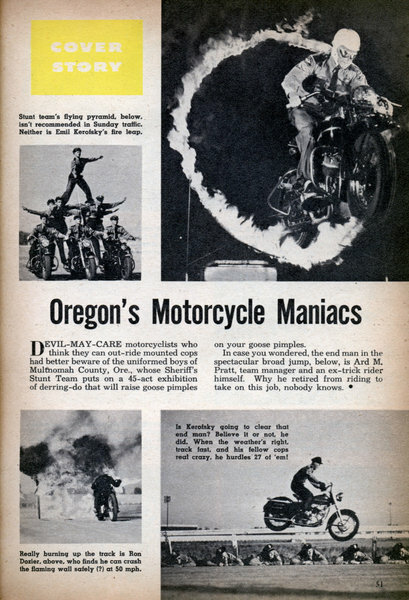 Friction drive, four speeds forward. Sheet metal body over wood frame. Independent wheel suspension, no axles. Wheelbase 100 inches. Weight 600 pounds. Original price $375. Designed by William B. Stout.